This grant is sponsored by a gift from Biotone. This grant is sponsored by a gift from The Oberweiler Foundation.. The goal of the massage program is to offer a therapeutic service to women who have had violent experiences with human touch. The massage will help with post-traumatic stress disorder (PTSD), anxiety, and depression. It is a needed respite for women who sometimes struggle to just feed their children. HandReach is a network of compassionate professionals dedicated to improving quality of life for burn and trauma survivors. 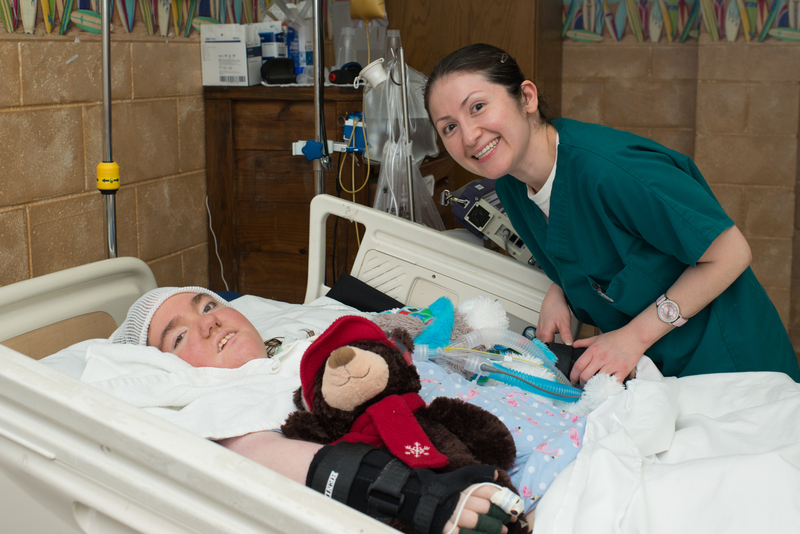 HandReach works at the acute, reconstructive, and psychosocial levels to help individuals debilitated by severe burns and amputations return to full function and a productive future. 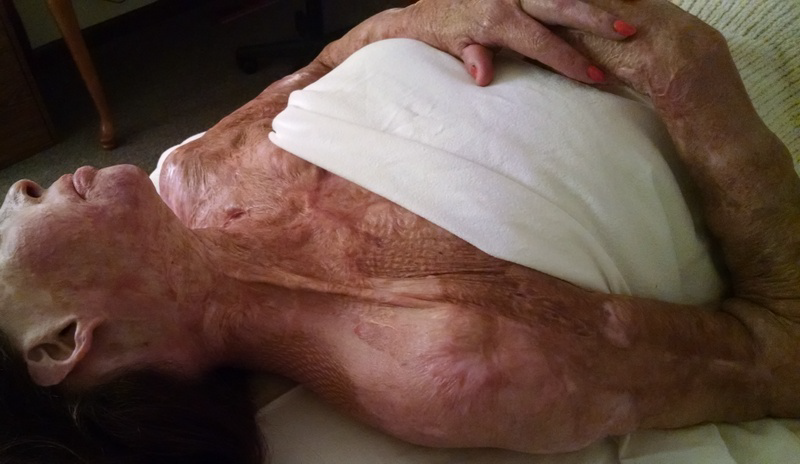 The objective is to provide massage and burn scar therapy to underserved burn survivors in the New England area who might otherwise not be able to afford treatment. Financial hardship may be due to being out of work during their recovery; not being able to return to work; or permanently disabled. Recognizing the responsibility of communities to help those who serve, Clear Path for Veterans empowers service members, Veterans, and their families through supportive programs and services in a safe, respectful environment. Clear Path for Veterans is fully accessible for Veterans with mobility limitations. The Massage Therapy Foundation funding will facilitate a demonstration project to help Veterans who have participated in programs at Clear Path for Veterans to take the next step, and access services in their home communities. Massage Monday for Veterans will offer a package of two one hour massage experiences to Veterans in Central New York to address issues of stress, pain, anxiety and/or difficulty sleeping. Massage Monday for Veterans participants will be identified through outreach efforts from the existing Clear Path Wingman, Peer Mentor and Dogs2Vets programs. The Maryville Children’s Healthcare Center (CHC) treats medically fragile, technology-dependent infants and children who need hospital-to-home transitional care or palliative and hospice care. The CHC offers individualized care and crucial parental training of specialized child care in a homelike environment that combines traditional medical care with alternative medicine approaches to relieve pain, enhance comfort and facilitate healing. The Massage Therapy for Medically Fragile Children program is designed to improve the overall well-being of CHC pediatric patients as well as adjunct the traditional allopathic medical and nursing care. Specific objectives include employing massage therapy to relieve pain and reduce the need for pain medications; enhance physical comfort; facilitate healing/recovery from wounds and orthopedic surgery; increase tolerance to chronic therapies such as ventilator, gastric feedings and IV nutrition, and increase socio-emotional engagement through the positive sensations generated by human touch. These outcomes are documented in patient case notes, which include data on vitals, medication and other medical services delivered, and measurable data reflecting stress levels and other quality of life indicators. The alternative therapy program was implemented in the spring of 2014 with an initial grant from the Oberweiler Foundation. The impact of stress and how it it’s addressed continues to be revealed in growing numbers of physiological and health and community health research. The use of alternative therapies to complement traditional western medicine has grown alongside the increase in the numbers of medically fragile children with special health care needs. According to the 2012 National Health Interview Survey (NHIS), 11.6 percent of the more than 10,000 children aged 4 to 17 included in the survey had used or been given some form of complementary alternative medicine (CAM) during the past year. More than half of children with chronic medical conditions use some form of CAM, usually along with conventional care. The National Center for Complementary and Integrative Health (NCCIH), one of the National Institutes of Health, reports the beneficial effects of massage therapy on pain and other symptoms associated with a number of different conditions. Much of the evidence suggests that these effects are short term and that people need to keep getting massages for the benefits to continue. The Program for Torture Victims (PTV) is a 501c3 nonprofit organization that was founded in 1980 to address the complex psycho-social and health needs of survivors of political torture. For the past 35 years PTV has provided comprehensive services to immigrant survivors of political torture living in southern California. Torture survivors we see have mostly experienced complex trauma (sexual violence, physical assaults, prolonged periods of detention and/or isolation, psychological persecution/intimidation/threats, community/state violence, trafficking, domestic violence) and arrive from over 70 countries across the globe. PTV will offer therapeutic massages services to help bring relief to the suffering of torture survivors. The provision of massage therapy will help to alleviate pain, reduce muscle tension, decrease stress and help survivors regain connection with their body. Established in 1908, CBM is the world’s oldest development organization focused exclusively on the needs and the rights of person with disabilities. CBM’s mission is to improve the quality of life of persons with disabilities and those at risk of disability in the poorest countries of the world. They currently work in 68 low and middle income countries with a network of local partners in those countries. The grant, combined with what individual donors will match will provide essential massage and physical therapy services to 250 children with cerebral palsy. It will provide training and support through parent support groups to parents of these children It will also provide essential new skills in massage and physical therapy techniques as well as supportive supervision to 14 CBR workers who will receive necessary training and supportive supervision. The project has the potential of being the spark to improving massage and physical therapy access to people with cerebral palsy and their families in Honduras, Guatemala, El Salvador and Nicaragua. This grant was sponsored in part by a gift from Biotone. For 44 years, Cancer Family Care (CFC) has served the Greater Cincinnati and Northern Kentucky community as a non-profit social service agency offering a comprehensive array of programming that provides well-rounded support to children, adults, and families coping with the often devastating and overwhelming impact of cancer-related illness. As part of its Waddell Family Healing Hands Program, CFC offers free oncology massage to cancer patients. With this grant, an estimated 39 cancer patients will receive four free massage therapy sessions. The outcome of the program is to reduce cancer patients’ physical symptoms of pain, stress, soreness, fatigue, muscle tightness, and spasms. CRC also hopes to enhance cancer patients’ sense of well-being and improve their quality of life. Pushing Boundaries aims to provide intensive exercise therapy that strengthens and supports people living with paralysis, to maximize health and improve quality of life. The grant will be used to integrate massage therapy into the existing program of exercise therapy, both as a direct service to clients and as a pilot study for effectiveness. Staff will focus on wheelchair users with shoulder/arm impairment, and massages will be received in 60-minute sessions. Veterans Helping Veterans Now works to build healthier lives for veterans and their families while increasing community awareness of veterans’ challenges and needs. The program will provide quarterly training workshops for the 2014-15 grant year for participating massage therapists. Workshops will provide support and specialized education on how to work with people who have experienced trauma. Click here to read more about the program. New Orleans Community Outreach is a non-profit organization that provides access to programs and services offered by the New Orleans Healing Center to the under served in the community. The grant will be used to provide massage to women in Louisiana who are survivors of human trafficking. After years of exploitation, this population has developed a negative association with physical contact and we are working to change that. Since starting the program in September, massage therapists have been meeting regularly with these women and providing massage while talking about different techniques for relaxation. The women live at Eden House, a residential home in New Orleans that provides two years of housing for the women as they rebuild their lives. Advocates for Survivors of Torture and Trauma (ASTT) provides specialized case management and psychological counseling services for survivors of torture. Many ASTT clients suffer from PTSD and commonly report problems with insomnia, anxiety and depression The program will use hands-on healing as a weekly complement to talk therapy. Massage therapy volunteers will be trained to give ASTT clients four treatments, and their psychological symptoms will be measured at the first and fourth sessions. primarily be provided by our trained grief massage therapists. This project has provided enormous relief for the HIV-positive clients of Gay Men’s Health Crisis (GMHC). Every year, GMHC serves thousands of people living with HIV/AIDS who struggle with severe obstacles to their financial, social, mental, and physical well-being. With the help of the Massage Therapy Foundation, GMHC will provide critical wellness services that alleviate general stress and the debilitating effects of HIV/AIDS medications — including pain, nausea, muscle aches, fatigue, headaches, difficulty sleeping, and neuropathy. This grant will also assist in implementation of a number of massage sessions. This project will work with families throughout east central Iowa,teaching parents the basics of infant massage, the benefits of which are to increase muscle tone, improve digestion, enhance sleep, and increase parent-baby bonding. Parents will receive chair massages to experience the stress-relieving benefits of massage for themselves. We will provide a free monthly class to caregivers, teaching the basics and benefits of infant massage. Thanks to the Massage Therapy Foundation, the Children’s Hospital Los Angeles (CHLA) in collaboration with the Heart Touch Pediatric Massage program will provide massage therapy to children who are in need of CAM therapies for palliative care. 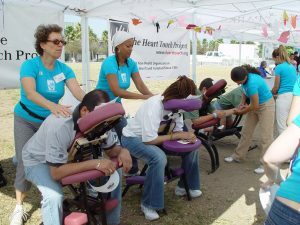 The Heart Touch Project, which has a contractual agreement with Children’s Hospital, will train and oversee volunteer massage therapists to administer massages to an estimated number of 40 patients throughout the grant year. Hurricanes Irene and Lee deluged the northeast United States in August of 2011, causing severe flooding in Northern Ulster, Delaware, and Greene counties of New York. Although the initial wave of government support has died down, many local people are still reeling from the floods’ impact on their lives and bodies. Healthcare is a Human Right (HCHR) and Family of Woodstock have been partnering since the hurricane to help the affected communities, and they are committed to continuing this practice. The grant will assist with paying the practitioners affiliated with HCHR $30 an hour to provide free clinics for the homeless. Four free clinics will provide multiple forms of bodywork and other holistic modalities to more than 150 individuals, helping them to cope with stress and health issues stemming from the destruction of their homes and the local economy. For those who are attempting to begin new lives after release from prison, difficulties in finding employment, locating stable housing, and maintaining relationships are a reality that lead seven out of 10 offenders back to prison within three years. Free Fulfillment offers stress-reducing professional massages in order to help people re-enter society. A prior recipient of a Community Service Grant from the Massage Therapy Foundation in 2011, Free Fulfillment had a 96% success rate at reducing stress levels in participants. This grant will take place in four 90-day cycles. During each cycle, six participants will receive a total of four massages and three counseling sessions. A final counseling session will take place during the last month of the project’s grant period, at which point the entire project will be assessed. Former participants will also receive 30 minute chair massages for referring others to the program. Compassion. Dignity. Respect. These can all be found at The Respite, A Centre for Grief and Hope, which helps those who’ve suffered the loss of a loved one reclaim their lives. As part of a holistic approach, grief massage can allow some of the physical manifestations of bereavement to be acknowledged and addressed, freeing individuals and families to undertake the mental and spiritual work of healing. Provide an initial three weekly 60-minute Swedish massage sessions to 18 individuals who have suffered traumatic loss in the past year. Train six new therapists in grief massage, who will then offer three sessions to another 20 individuals, for a total of 38 clients to receive massage. Each of these newly trained therapists will then go on to volunteer another 10 hours of grief massage, greatly expanding the impact of the grant beyond the initial project. This grant was sponsored in part by a gift from AMTA Massachusetts Chapter. In Iraq and Afghanistan, servicemen and women often suffer severe mental and physical trauma. The Cause (Comfort for America’s Uniformed Services) Massage Program at Fort Hood, Texas, aims to give back to these individuals by easing some of the pain and stress incurred in service overseas. 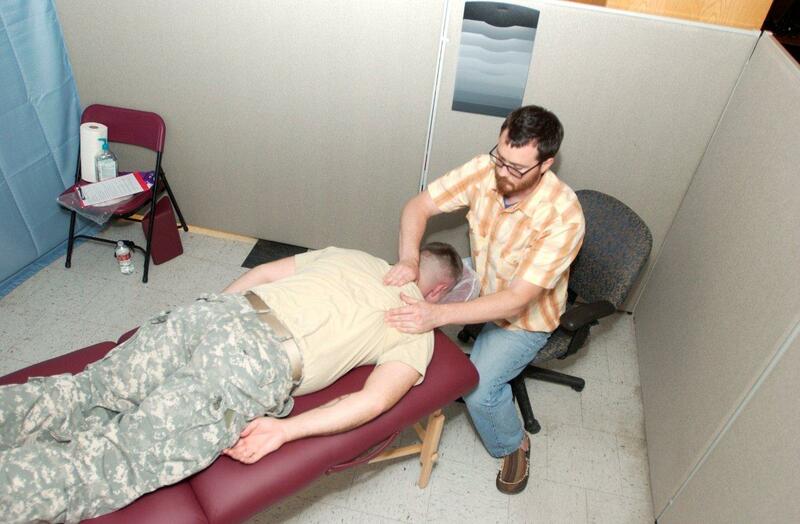 The massage program, part of the Warrior Combat Stress Reset Program at the Carl R. Darnall Army Medical Center, is open for three hours twice a month, and has been growing steadily since its inception in 2010. The high demand for massage services is currently being met by 17 volunteer therapists. The grant will provide a $300 monthly stipend for a coordinator to schedule massages, manage therapists, purchase massage supplies, recruit volunteers, and build community support for the program. Most seniors living in rural areas near the Indiana/Ohio border do not have access to massage, whether because of a lack of transportation, reliance on a fixed income, or simply because they and those around them do not have awareness of its benefits. Thanks to this grant, the Reid Hospital Massage Therapy Senior Outreach Program will provide a year’s worth of massage therapy to this often touch-deprived population. 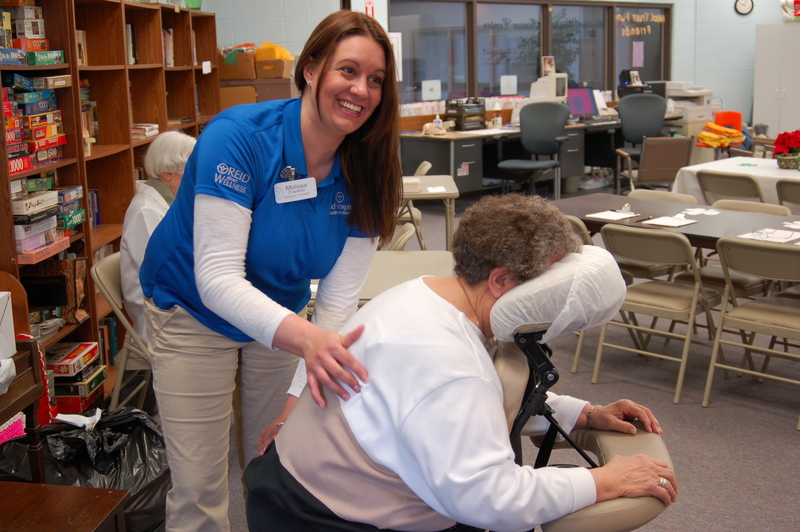 The grant will provide eight therapists with $17.20 an hour to travel monthly to four senior centers in Cambridge City, Connersville, and Richmond, Indiana, as well as Eaton, Ohio, to provide chair massage (or equivalent services to those with limited mobility). An estimated 80-90 massages each month, and a total of 1044 massages over the course of a year, will be provided to approximately 350-400 senior citizens who would not otherwise have the opportunity to experience professional massage at this important time in their lives. This grant was sponsored in part by a gift from AMTA Arizona Chapter. Paying a debt to society in prison is tough, but reentry can be challenging as well. This project helps provide massage therapy services for formerly incarcerated individuals. These men and women ranging from ages 25 to 55 are working with parole services in New York City to transition back into society. Each individual spent a decade or more in prison, and have been released in the past year and have very few financial resources and little information regarding qualitative life activities. Additionally, they may have been traumatized by their years of incarceration because of incidences of sexual assault, improper medical care, and limited or no communication with family. Most come from the poverty stricken boroughs of Brooklyn, Bronx, Staten Island, Queens, and Manhattan. A total of 24 clients (including eight women) will be screened for participation and will receive four one-hour massages every other week for eight weeks, supported by counseling sessions on alternate weeks. The massage therapists will only deliver the work; they will not engage in conversation about the clients past experience of incarceration or the transition process. The project goal is to help reeducate these individuals and empower their physical and mental readaptation to touch so they can experience quality of life in a holistic forum. 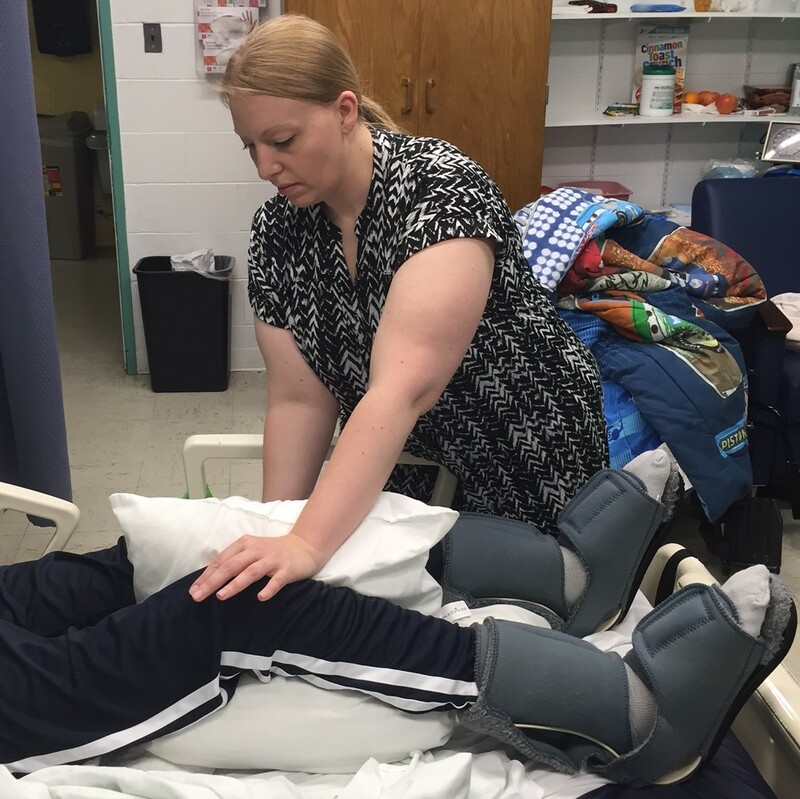 From their campus in Bloomington,Minnesota to remote Costa Rica, massage therapy faculty and students at Northwestern Health Sciences University are making a difference. The NHSU educates natural health care practitioners in massage therapy, chiropractic, acupuncture, and Oriental medicine. One of its chiropractic graduates manages clinics around Heredia, Costa Rica. Clinic clients vary widely in age, marital status, and family size. Almost all are of limited income and not able to afford the cost of Costa Rican national health care. In fact many indigenous patients travel six to 10 miles on horseback to reach La Clinica. Chiropractors and chiropractic student interns have worked in the clinic since 2000, but now massage therapy services are being integrated into the clinic’s offerings. Not only will this partnership provide therapeutic massage to a needy population, it will also help educate chiropractors about the benefits of integrating massage therapists into their treatment plans. Specifically, the granted funds will help offset expenses for a total of 12 massage therapists to travel to the area over the next year to deliver an estimated 480 massages. Therapists will pay the remainder of the travel/ living expenses themselves. Coordinators anticipate that at least 160 individuals will receive an estimated three massages thanks to La Clinica offerings in their communities. Since 1954 SAGE Eldercare has been dedicated to the independence, well-being, and quality of life for older adults and their caregivers. Providing services from Meals on Wheels (50,254 Meals to 283 older adults in 2010) to adult day care (6,500 days of care for 102 clients in 2010), SAGE is one of our countryÕs hallmark programs for aging adults. 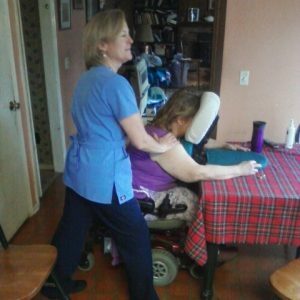 Thanks to this grant SAGE will now expand the benefits of its HomeCare home health aide services by including complementary massage therapy for its clients. Massage will aim to reduce the anxiety, chronic pain, depression, and insomnia resulting from the many challenges HomeCare clients experience. The HomeCare nursing supervisor is a nurse/massage therapist and she will train a group of approximately 10 certified home health aides to conduct hand and foot massages for clients as part of their daily, weekly, or live-in care. Up to 60 vulnerable older adults will benefit from these nurturing massage sessions. After assessment, the supervisor will designate roughly 20 clients with the greatest need for massage therapy. Each one of these seniors will receive one 30-minute massage every other month for a year, deepening their level of care. The Bee Busy Wellness Center (BBWC) is located in an area where clients live at or below 150 percent of the federal poverty level. Its client base consists primarily of Black/African American and Hispanic/Latino women, from the impoverished to those who’ve recently been released from prison. These women are at highest risk for drug use/abuse, hypertension, and sexually transmitted infections. BBWC’s services are designed to promote empowerment and self-esteem, and encourage proactive wellness results in their clients’ lives. This grant is dedicated to adding massage to the BBWC offerings and demonstrating the health benefits of massage. BBWC will identify 50 women in need and provide them with five massages over a six-month period at no charge. Massage sessions will be tailored to the clientÕs individual needs and challenges. The program’s objectives include increasing awareness of the benefits of massage, identifying women who can benefit from the program, decreasing their level of stress, and increasing the number of female BBWC clients who take responsibility for their own health and wellness). Many of these women are from low-income families and deal with children who have special needs, so the health benefits that stem from their massage sessions are exponentially valuable (or doubly valuable). The overall goal of the project is to help clients learn about the connection between body, mind, and spirit and teach them how to move toward positive and productive life choices. Going to camp means unbridled fun and adventure especially if you’re a special needs child and every day is a gift. So Shay Beider of Integrative Touch for Kids has designed a no-cost Healing Retreat getaway at an Arizona ranch that serves as a haven for children who have developmental disabilities, genetic conditions, chronic, acute, and life-limiting illnesses. More than 60 healing arts practitioners (including 15-25 massage therapists) blend their expertise to provide access to therapies to assist in pain management, improve quality of life, and empower the children to be part of their own healing processes. The families also share in the retreat experience, escaping and relaxing, but also gaining knowledge about how to better care for their children as well as themselves. This grant allows for two days of tailored training for 15 massage therapists prior to each Healing Retreat. They’ll learn massage techniques especially for these special needs children, unique communication methods, additional skills for relating to family members and caregivers, safety guidelines, and specifics to help them adhere to limitations. By the end of the grant reporting period, an additional 20 massage therapists will be eligible to provide massage to these children and 14 children with special needs and their 44 family members will have benefitted from a Healing Retreat. Participating massage therapists volunteer their time to the children and their families, providing invaluable therapeutic services and education. Two university research studies, in collaboration with the National Institutes of Health, will help evaluable the program to ensure the success of future retreats. Outside In provides primary health care to more than 7,400 homeless and low-income people in Portland,Oregon. For more than 40 years center staff have provided care on a sliding scale; those unable to pay are still treated. Services include substance abuse and mental health treatment, and chronic disease and medical case management. Integrated health options include acupuncture, naturopathic medicine, and chiropractic. The center has had intermittent volunteer massage therapy available for clients receiving care for physical trauma in the orthopedic clinic. The center staff members have realized how tremendously powerful and transformative massage therapy can be for homeless people and those with severe mental illnesses; individuals whose bodies are often neglected and abused; so they want to make healing touch more available to their clients. This grant will allow the center to hire a part-time massage therapist to provide four hours of 50-minute therapeutic massages a week to at least 200 clients over the course of a year. The staff massage therapist will also integrate and coordinate the work of additional volunteer massage therapists with that of other health care providers. This first year of funding from the Massage Therapy Foundation will help strengthen the existing business model and allow Inside Out to sustain and grow the program in subsequent years. Life can be challenging for indigenous people in Mexico. The contrast between the extravagant tourist resorts and the remote, destitute villages is marked. Since 1977 the Center for Traditional Medicine (CTM) has directed a small public health clinic in rural Mexico. The CTM promotes cross-cultural healing arts and works for social change to benefit individual and community health standards. Founder, massage therapist, and researcher Leslie Korn, Ph.D., has hosted volunteer health professionals (medical doctors, naturopaths, nurses, and physical therapists) and made massage therapy available to impoverished locals. Five distinct indigenous communities populate this region. The vast majority of those seeking health services are women and children (only 5 percent men), hence this outreach effort that seeks to improve their quality of life and health. While only 40 miles from wealthy Puerto Vallarta, this area is isolated and its unpaved roads are often inaccessible during the rainy season. This grant provides funds to expand the clinic’s efforts into additional villages to continue to provide treatment for those suffering from chronic pain as well as from untreated or insufficiently treated injuries. Two massage therapists will give one-hour massages in the rural clinic or travel overland as necessary to reach immobilized clients. Many of these clients work in the fields, tend their families in inadequate conditions, travel rough terrain by foot, and correspondingly suffer from osteoarthritis of the elbows, hands, and knees. Massage therapy is meant to enhance their indigenous solutions for pain resolution and mobility, and promote self-care. 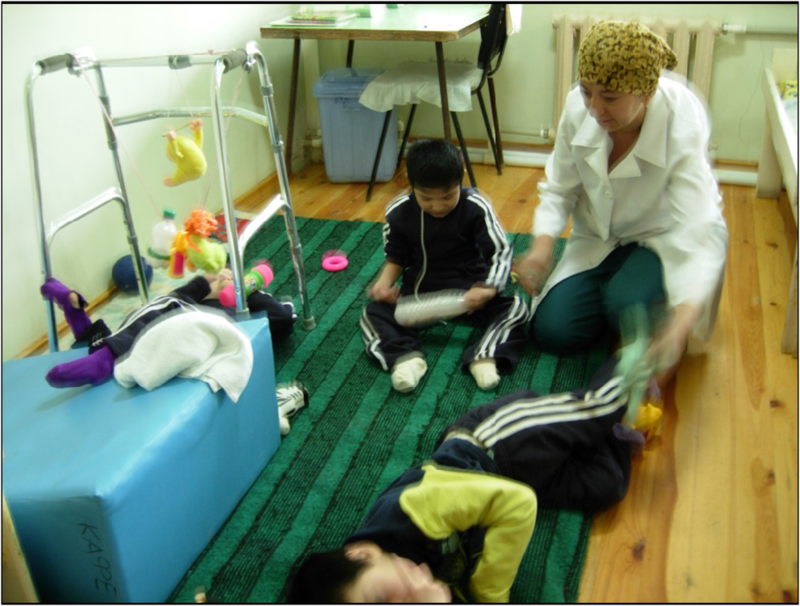 In remote Uzbekistan 350 disabled children are housed in a government-run orphanage. In this culture, mentally and physically challenged individuals are often ostracized and shuttered in institutions, facing a lifetime of isolation and exclusion. Ages 4 to 18 years, these children have broad range of abnormalities from central nervous system disorders to cerebral palsy. If they are not able to walk by the time they’re 18, they most certainly face a lifetime of institutionalism. The first volunteer massage therapist from funded by the Massage Therapy Foundation travelled to this orphanage in November 2008 as part of Medical Teams International (MTI) and a second ventured there in February 2009. These practitioners provided bodywork to 320 orphans, but also reeducated 30 caregivers about the benefits of using massage techniques appropriate to these children’s needs instead of the traditional, aggressive style of massage. Based on the results from the previous trainings, the MTI team is optimistic about bedridden children being able to crawl or even walk following massage therapy. In fact after the 2008 and 2009 trips, 80 children who were previously confined to their beds can now walk. Thanks to this grant, two additional massage therapists will travel to the area in 2010, train local caregivers, and empower them to share their techniques with others making this initiative sustainable and available for many more children. The volunteer massage therapists will use this funding for their airfare, three weeks of lodging, and minimal supplies. Since 2007 massage therapist Jennifer Greene has brought massage to clients of this urban-based clinic that serves as a safety net of care for many low-income women and children from the surrounding neighborhoods. Recently she became a Certified Infant Massage Instructor and started bringing the work to the at-risk families served by the Women and Children’s Hospital of Buffalo (WCHOB). The Bonding with Baby program gives parents safe space to focus on themselves and their baby while learning infant massage techniques. Greene will provide outreach services to target all new mothers who delivered babies at WCHOB as well as fathers and caregivers with enhanced outreach to encourage participation of moms from high-risk environments. An estimated 60 parents and their infants will attend four weekly 1.5-hour classes the first month of the program and follow-up refresher classes three months later and six months later. An estimated five parents and their babies will participate in each session, ongoing over a one-year period. Each parent will provide six massages to each infant or one massage at each of the six training sessions. This grant augments approved funds from WCHOB and enables marketing and outreach for the project. Parents will also learn the warning signs for postpartum depression and reap the benefits of infant massage as a powerful element in human bonding. Many of Greene’s initial clients were thrilled to report that their babies slept better through the night and experienced less colic thanks to their massages. Many of these new moms (and dads) are teenagers who come from a cycle of abuse and neglect. Although they were likely raised without nurturing touch, this program can give them the skills to bring healthy touch to their newborns and enrich the family bonding experience. This organization has served the needs of Latinos in Eastern North Philadelphia for more than 30 years. This project coordinated by the congress Esfuerzo program will bring massage therapy and its immune-boosting elements to those living with HIV/AIDS. 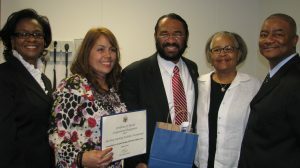 As of April 2009, Esfuerzo was serving 171 clients (primarily Puerto Rican) with an annual goal of 300 clients by 2010. This community has the lowest median income of any ethnic group in the city and is deeply affected by the HIV/AIDS epidemic. 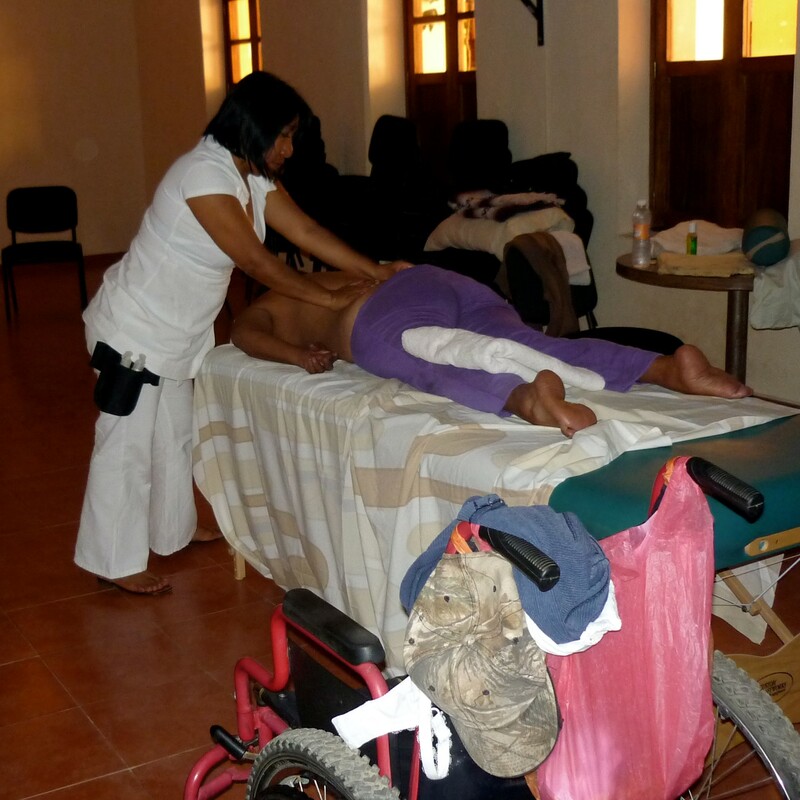 Although massage is recognized as extremely beneficial for individuals living with HIV/AIDS, the therapy was previously absent from the array of services offered at Esfuerzo. Thanks to this grant, a massage therapist will provide onsite chair or table massage every Thursday for four hours beginning September 2009 and continuing for a year. Clients can book two appointments monthly for 20-minute sessions. If someone breaks an appointment, another client may have an extra session. On any given Thursday there are 15 to 40 individuals attending support groups at the center, ensuring a steady flow for the therapist. Up to 12 clients a day equates to the possibility of 624 total annual sessions. Project leaders anticipate that the program will benefit 50 to 100 clients during the grant period. Although it is impossible to include all active clients because of their fragile health and travel restrictions, the care and compassion of a professional massage therapist has the potential to enormously affect the health and quality of life of the clients who do receive the work. The Immune Enhancement Project (IEP) will provide massage therapy to underserved people living with HIV/AIDS and other chronic, potentially life-threatening diseases. Over a one-year period, practitioners will provide regular monthly massages for at-risk, low-income clients who live with disabling and chronic illness, particularly HIV/AIDS, cancer, and mental illness. IEP plans to build on its success by demonstrating the effectiveness of massage therapy in a community setting and improving the quality of life of clients as well as reducing the need for more costly and invasive modalities. Approximately six massage sessions will be given to each individual ranging from 2 to 10 sessions depending upon client wishes and needs. An estimated 336 massage sessions will be provided, free of charge, in at least four local health clinics. The corresponding evaluation process will consist of self-reporting, comparison of pre- and post-program baselines and practitioner assessment. In its 25-year history, IEP has established relationships with the San Francisco Health Department and San Francisco’s community health centers, along with the San Francisco AIDS Foundation and the Grace Jones Richardson Trust. IEP leaders are working to garner additional support from other private donors and foundations. Their well-established relationships with other service providers and healthcare organizations offer a unique access to clients and collaborations. The benefits of massage therapy for reducing stress, lowering blood pressure, enhancing sleep, and easing chronic pain are proven. The professionals implementing this initiative will take massage to rural Texasby holding 10 massage therapy events over a one-year period. Targeted clients will be adults aged 60 and older, with priority given to those who have disabilities or are living in rural areas with limited access to services. Also included will be family caregivers of any age who are caring for adults over age 60, as well as individuals aged 55 and above who are the relatives and family caregivers of children aged 18 or younger. Chair, hand, or foot massages provided at local senior centers will allow these individuals to experience the healing benefits of massage. Individuals may receive more than one massage, but only one per event. The West Central Texas Area Agency on Aging is home to more than 47,000 seniors, many of whom are living in remote areas. The local prevailing mindset is that massage is a luxury available only to the wealthy and to city dwellers. The goal of this outreach project is to help educate an estimated 50 to 100 people about the wellness benefits of massage therapy. From the elderly who are often starved for touch to the caregivers who have so many burdens to bear, the healing effects of massage therapy will offer welcome respite. Nationally more than 50 million individuals take care of a family member or friend during any given year. Professionals working with the Hospice at Home program inSt. Joseph, Michigan, attend to the needs of more than 850 patients a year and know that caregivers are integral to their patients’ comfort. This $5,000 grant will bring an average of six free massages a week (approximately 336 sessions over the year) to an estimated 90 caregivers. This program services caregivers in four Michigan counties, the majority of whom are age 65 or older. These complimentary massages will help soothe the extreme stress, fatigue, muscle tension, and anxiety commonly experienced by caregivers. These factors can reduce a caregiver’s lifespan by a decade. Massage therapists coordinating this program have backgrounds in hospice care and psychiatric work, so they’re able to provide massage while understanding their clients’ emotional needs. This program will train adult and teenage volunteers in providing gentle-touch hand massage to hospice patients. 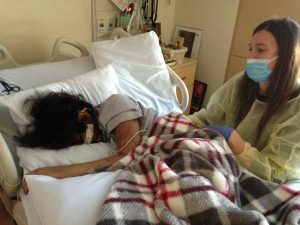 Training for volunteers will be given by a licensed massage professional and will include hand massage techniques along with the education and emotional support needed to work with patients who are dying. For hospice patients, pain management is an overriding goal of providing quality end-of-life care. The objective is to increase relaxation, reduce anxiety, and therefore improve quality of life among hospice patients. Approximately 50 terminally ill patients will be served by this program. The Santo Domingo Pueblo (SDP) community includes about 4,800 members who live on ancestral tribal land in Central New Mexico. This project focuses on giving massages to 50 members of the community who are diabetic or have other chronic diseases. American Indians experience diabetes at three times the rate of the general population. Massage therapists will incorporate Western and traditional Native medicine to promote health and healing, providing massage, reflexology, relaxation techniques, and other alternative therapies not provided by Indian Health Services. Massage therapists will visit schools and youth programs to conduct presentations on massage and will initiate alliances with other health care providers. The program’s objective is to develop a campaign to educate community members about massage and its benefits and to raise the awareness of massage therapy as a career choice among young people. This project is a Praxis Housing outreach program serving an estimated 340 adults daily in four housing facilities in New York City. All clients are homeless adults with HIV/AIDS, physical and mental illness, histories of substance abuse and incarceration. All are destitute; 78 percent are male; 78 percent black; 20 percent Hispanic; 2 percent Caucasian. They’re trying to work their way back to health and recover financially. The $5,000 grant will bring massage to an estimated 225 clients, based on serving five clients a week for 45 weeks. Clients in all four facilities will have the opportunity to benefit from massage once a month. Massage therapy will help them relax, alleviate their stress, lift their spirits, and instill hope and faith for a brighter future. 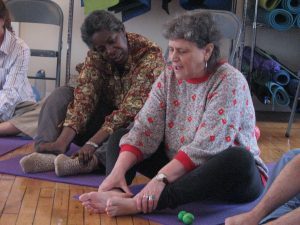 This grant funds a collaboration of The Family of Woodstock Inc., and Health Care, a Human Right (HCHR) to service four clinics in the Kingston, New York, area for a 12-month period, providing forms of massage, bodywork and holistic health care modalities to more than 200 individuals. The clients include individuals who have recently been homeless or runaways, domestic violence victims and others who would not generally have access to these services. This project will be staffed with 11 therapists and two administrators. The ongoing project includes educating the clients on how to improve and maintain wellness through lifestyle changes and exercises and to inform the community of these programs and promote personal well-being. The goal of this project is to teach infant massage to mothers suffering from symptoms of postpartum depression (PPD) by expanding the current infant massage program at Swedish Covenant Hospital. The objective is to use infant massage to strengthen mother-infant interactions and bonding, to decrease the mothers symptoms of PPD, and support the health development of the infant through improved sleep habits, less colic, more attachment to their mothers, and less anxiety. The program will serve 24 to 36 mothers over the course of a year. Each mother will receive around five one-on-one infant massage instruction classes. The audience for this program is mental health consumers who will be trained in self-empowerment, relaxation and stress relief by emphasizing the mind, body, spirit connection. The core program offers weekly classes that educate participants on the importance of touch, self-massage and self-acupressure to calm the mind and promote stress reduction. Individuals diagnosed with mental health challenges will receive chair or table massages over a 10-month period. 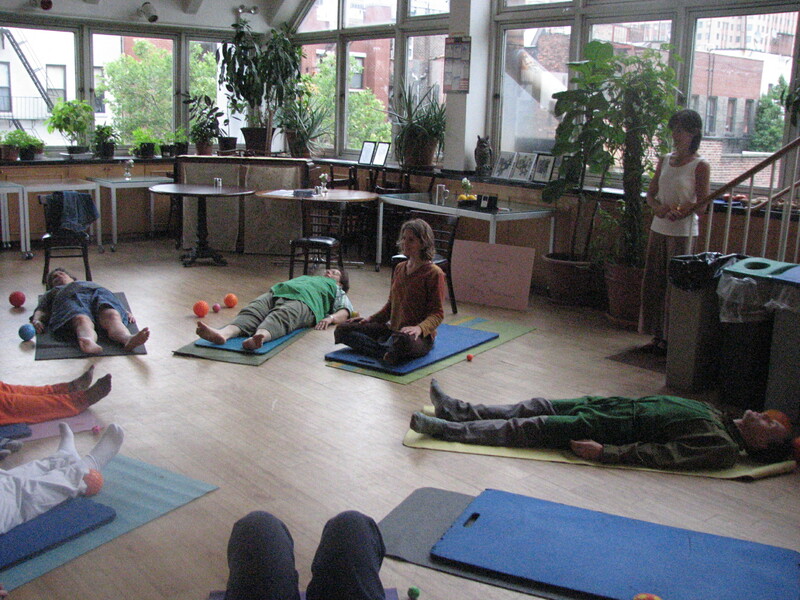 A related outreach program for 12 participants is based on a continuum of stages that includes 1) learning self-nurturing strategies and techniques from multiple bodywork modalities and keeping a healing journal in which participants note their emotional and physical state before and after class; 2) training on partner stretches and massage techniques, and continued journaling, and 3) empowering participants to travel to a local yoga and wellness studio. Midway in the program, participants will be offered two private 45-minute massage sessions plus 15 minutes of processing time. This project also includes two experiential presentations for caregivers, parents, nurses, therapists and other interested participants, presence at two National Alliance on Mental Illness annual events, and training massage therapists in the principles of touch and massage as a mental wellness empowerment tool and service of compassion. The goal of this program is to train caregivers of the elderly to provide massage techniques that can alleviate some common health problems, including muscle pain, insomnia, abdominal discomfort, depression, and anxiety. Training will be provided by St. Peter’s Hospital, a multifacility health system. Approximately 10 training workshops will be held at area community-based senior organizations for family members and professional caregivers throughout the year. An estimated total of 200 caregivers will be trained. In 2007, Medical Teams International’s volunteer medical teams served 3.2 million individuals in 51 countries. This project focuses on Uzbekistan’s Tashkent orphanage, home to 320 disabled children ages 4 to 18 –190 are boys, 130 are girls. 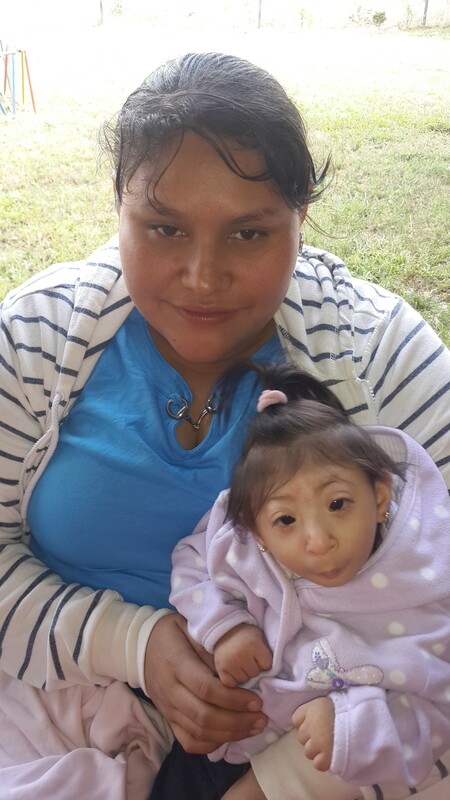 They suffer from abnormalities in the central nervous system, congenital physical abnormalities, cerebral palsy, hydrocephaly and a number of other hereditary diseases. Of the 320 children, 204 can walk, 36 can crawl, and 80 are bedridden. According to UNICEF, many of these children are orphaned because of parental poverty and unemployment, not death. Due to the stigma of disability in this country, these children face a life of isolation and exclusion. This $5,000 grant will allow two American massage therapists to travel to Uzbekistan for three weeks, deliver massage to each of the 320 children, and teach caregivers the basics and benefits of massage therapy. This training will plant the seeds for lasting behavior changes in the orphanage’s youngsters and staff and serve as a wonderful cross-cultural experience for participants. 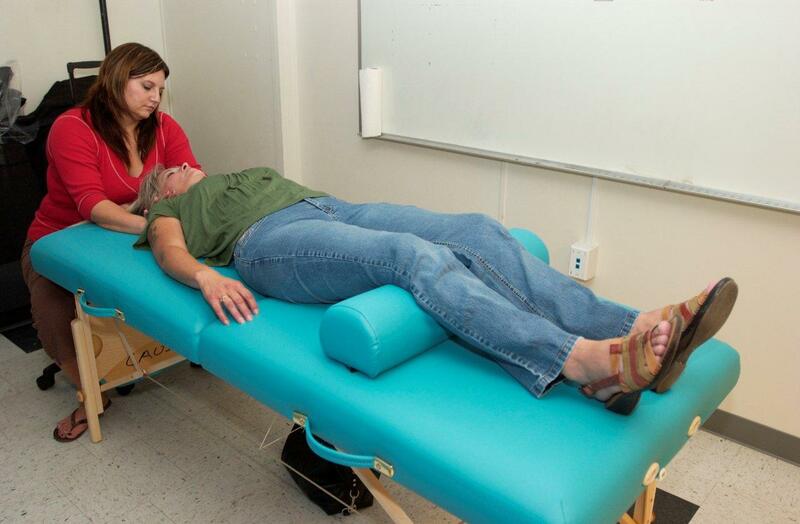 An estimated 6,000 homeless individuals live in Seattle and this program sought to build and strengthen massage and bodywork accessibility for this population. Alternative Healthcare Access Campaign (AHAC) volunteers have provided more than 5,000 treatments to more than 2,300 people since it started in 1999. By forging relationships with schools and area practitioners, their four-practitioner task force aims to inspire bodyworkers to become involved in assisting the homeless. With this grant, AHAC offered trainings focused on how to work with vulnerable populations and the necessary skills/sensitivities to include in practice. Not only did the program aim to build an infrastructure to establish AHAC within the massage/bodywork community in Seattle through outreach to the massage schools and bodywork practitioner base in the area, it also provided a much needed continuing education focus for bodywork practitioners that would not be otherwise available in Seattle. Through increased visibility of the services offered and used as well as the benefits experienced by the homeless, the project leaders intend to effectively lobby for state funding to provide future alternative health services to the homeless population. Single parents often experience a great deal of stress as they work to meet the needs of their families. When they are also students, the challenge is that much greater. Anxiety, insomnia, and musculoskeletal pain are common symptoms that these student-parents carry with them as they carry out their responsibilities. Salt Lake City Community College’s Health and Wellness Services worked to relieve these symptoms through massage therapy while also building awareness about the value of wellness care. With these funds, 240 massage vouchers were given out to this ethnically-diverse group of student-parents of limited means. By encouraging student efforts in self-care and providing them the therapeutic benefits of massage therapy, the program helped single parents complete their studies while giving quality care to their families. With this grant, the Marjorie Kovler Center for Treatment of Survivors of Torture expanded its therapeutic massage program. 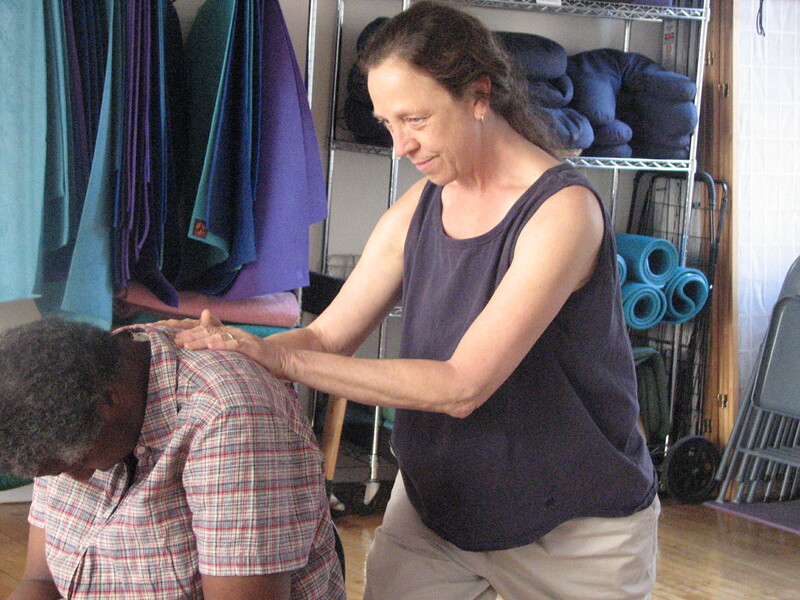 This Chicago program provided massage therapy for 20 torture survivors. Each participant received thirty-five 1-hour massage sessions during the 12-month grant period. Some of the benefits of massage for the survivors of torture include: empowering the individual, alleviating pain from musculoskeletal injuries, and decreasing psychological stressors. This nonprofit organization, operated mainly by volunteerism, provides medical, psychological, and social services to over 300 torture survivors from 50 different countries. 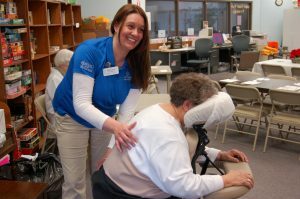 With the grant, collaboration time between massage therapists and the direct health care professionals was promoted, the pool of massage therapy volunteers increased, and updated training materials were developed and provided to new massage therapy volunteers. The White Earth Land Recovery Project (WELRP) used this grant to incorporate weekly massage into their holistic health program under the Mino-Ayaan: Be Well Community Health Project. Massage therapy was a new component of the project’s educational exploration of broader holistic and traditional healing programs for the White Earth reservation. The focus of this program is to address the wellness of the peoples, and to create a healthy generation of Anishinaabe. It was estimated that 260 people were served by this grant. WELRP is a multi-issue, non-profit Native American organization based on the White Earth Indian Reservation in northern Minnesota. They provide facilities and support for community food systems, traditional food restoration, support of indigenous spiritual and cultural traditions, and exploration of traditional healing projects. The White Earth reservation (Ojibwe/Anishinaabe) has a resident tribal population of around 11,000 residents, the vast majority of which are below the poverty level and in need of a broad array of healing services. Cornerstone Ministries has been working with developmentally disabled adults for 25 years. With the support of a grant from the Massage Therapy Foundation, they have expanded their care options to include massage therapy treatments for these individuals, their caretakers and staff. With these funds, two 20-minute massages were provided weekly to 30 people, free of charge. The massages were part of a relaxation regimen that includes aromatherapy, dimmed lighting and calming music. In addition to providing massage services, Cornerstone Ministries gave three free training sessions to area practitioners in technique, contraindications and the unique situations of this target population. They also provided “guest speakers” to area massage therapy schools to demonstrate viable techniques and methods of introduction of massage to those with cognition impairments and sensory disabilities. Founded in 1995, Heart Touch Project has been a leader in a movement to bring the therapeutic and curative benefits of professional massage therapy and bodywork to vulnerable populations. 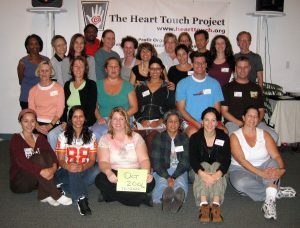 Heart Touch Project’s core service model consists of: (1) providing free specialized training to qualified massage and bodywork practitioners in exchange for their commitment to volunteer their skills for at least one year, and (2) matching each Training Workshop graduate on a one-on-one basis with an ill and isolated client to whom he/she delivers weekly customized therapy sessions at no cost. The grant from the Massage Therapy Foundation funded two volunteer trainings over a twelve-month period. This resulted in at least 40 new qualified and committed massage and bodywork practitioners who could provide more than 2,000 massages to non-ambulatory clients. Volunteers will work in facilities for the elderly, hospices, hospitals, and private homes throughout Los Angeles. The Heart Touch Training Program educates massage and bodywork practitioners in the sensitive touch skills required to work with the seriously ill. 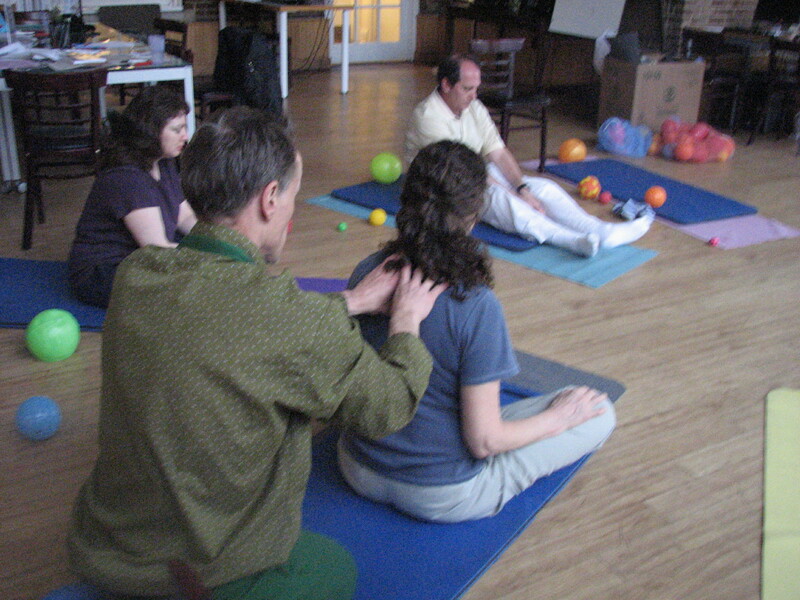 The curriculum covers basic requirements such as universal precautions, hygiene, equipment, technique and appointment protocol, and trains practitioners to: (1) understand the necessity of creating a healing atmosphere with the client, (2) individualize each massage session to meet the particular needs of the client, (3) define boundaries and establish the limits of the relationship, and (4) process their own feelings resulting from the impact of this work. This project was carried out by Hands on Health Australia (HOHA). HOHA is a not-for-profit group of volunteer health workers that promotes the health of marginalized communities through hands-on treatments. HOHA seeks to promote self-esteem & restore human dignity by engaging people to discover solutions to their own health care needs. The Massage Therapy Foundation grant monies were used to train six Aboriginal health workers to staff a clinic in the Hopevale Community. The training was designed to be sensitive to this distinctive cultural framework, both in the instruction and in the delivery of service to the community. The health workers learned how to run a complimentary and allied health clinic by working in a practice setting using a team approach with volunteer practitioners including: chiropractors, dentists, nurses, naturopaths, medical doctors, dermatologists, nutritionists and massage therapists. The clinic engaged elders & community leaders to serve a cross-section of community members seeking treatment for a variety of musculoskeletal conditions. Health workers also trained community members in self-massage treatments. The Boston Medical Center (BMC), provider of “exceptional care without exception” was awarded a grant to offer the benefits of massage therapy to cancer patients free of charge. With these funds, an estimated 360 patients in chemotherapy received approximately 140 hours of massage to help alleviate symptoms such as pain, fatigue, stress, musculoskeletal side effects, nausea, and depression. BMC is the largest private non-profit safety net hospital in the country. They provide over $350 million in free care annually. One of the secondary intentions for this pilot program was to increase awareness among their medical staff (and patients) about the value of massage therapy, and build institutional knowledge and operational capacity. 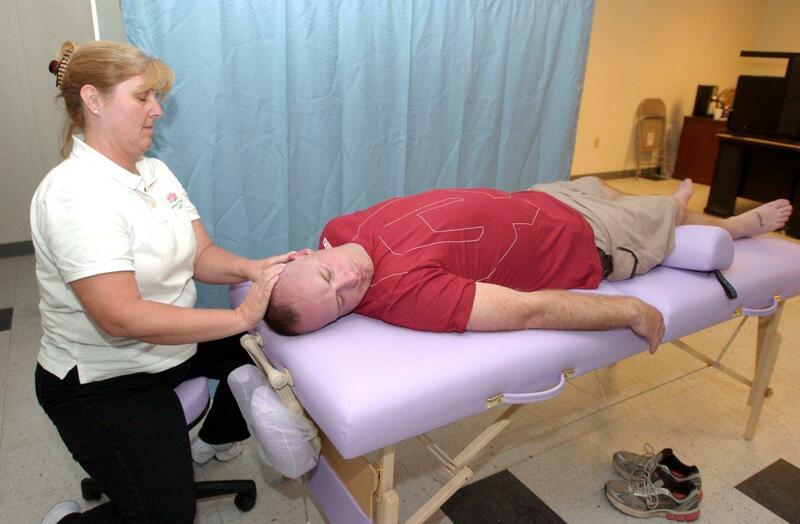 BMC is committed to continue this massage therapy program for cancer patients. This population faces considerable social and economic challenges in addition to the extraordinary physical and mental strains of cancer treatment. Massage treatments help with symptom alleviation and may increase compliance and tolerance of their conventional cancer therapy. The Southeast Burn Foundation (SBF) provides education and support to burn survivors across Florida, Georgia, and Alabama. Their Camp Amigo Project was for children 8-15 years old who are burn survivors. These children struggled with scar contracture, impaired range of motion, and compromised body image. The camp serves between 30 and 40 participants each summer. The funds helped to provide massage therapy to children on-site at Camp Amigo, integrating massage therapy with traditional treatments for burn survivors with matured scarring. After the camp, funds were used to provide extended term therapeutic massage to up to four children, tracking their progress. Parents and caregivers were given two 2-hour training classes on the benefits of massage therapy, including techniques they may use at home with their children. This pilot program included an extensive evaluation protocol with standardized measurements and evaluation response forms. The data collected enabled an analysis of the impact of massage therapy on impaired range of motion, scar size, and the pain associated with matured scarring. The data also measured functional levels, client well-being, and the degree of satisfaction with the program. The “Win-Win Hands On” program provided massage therapy intervention to low-income Latina clients at the South End Community Health Center (SECHC) in Boston,MA. For 35 years SECHC has served the Latino community. Forty-percent of this population demographic is overweight or “clinically at risk” for obesity. 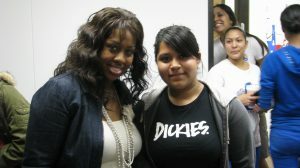 This project focused on the needs of overweight Latina girls, ages 8-13, with a body mass index over 85%. Each girl in the program was given eight half-hour massage therapy treatments on a bi-weekly basis, complementing existing nutrition and exercise programs. The goal was that through touch therapy, these girls would experience increased body awareness, self-empowerment, and enhanced body image along with increased circulation, relief of muscle soreness and stress reduction. By providing this intervention at a point early in their lives these girls are more likely to enjoy a more promising and healthful future. -Elizabeth Sommers, Project Leader, Pathways to Wellness, Inc., Boston, MA. The goal of this project was to increase the sense of safety and overall well-being of the children and staff at Lar da Crianca orphanage through massage therapy. The over-arching goal was that by creating a more nurturing environment that benefits children and caregivers, a new model of sustainable orphanages in Brazil could be proposed. Staff members were also trained in massage therapy so that the project could be sustained in the future. A total of 100 massage sessions took place for the staff and children. In addition to creating a safer environment, massage was administered to help raise awareness for the staff of the children’s bodies and their emotional needs, which allowed them to provide the children with even better care. This project provided chair and table massage to cancer patients in an outpatient setting at Presbyterian Cancer Center. Cancer patients were offered a 15-minute massage either before or after their cancer treatments in the Gynecologic Oncology and Radiation Oncology waiting rooms behind a privacy screen. By offering the program in locations that were convenient for the patient, a more successful outcome of promotion and the use of complementary therapies were feasible. The primary goal was to decrease anxiety, fatigue, pain, and other cancer related symptoms the patient may have experienced. The population served included six to twelve patients per day for an average of 36 patients per month during the granting year. The objectives of this program were to return a culturally recognized treatment to its people of origin, and improve the health and wellness of the Latino population of South Minneapolis. Adiago Holistic Therapies aimed to increase awareness that a culturally sensitive massage is available, and financially accessible, to this underserved community. On a larger scale, Adiago aspired to facilitate a trend toward offering culturally appropriate healthcare for the entire community. Maya Abdominal Massage is performed over clothing to the back and abdomen and works to soften musculature, align the pelvic bones, adjust the uterus to its proper position, release muscular armoring in the trunk, and enhance circulation of blood and lymphatic fluids. The program took place at Centro, a well-established service agency for the Latino Population in Minneapolis. The “Sanctuary” program is a volunteer-based massage therapy program for people living with HIV/AIDS. The project goal was to increase the health of individuals living with HIV/AIDS by enhancing the immune system through stress relief and relaxation, and to promote psychological well-being. Volunteer massage therapists trained in the specifics of providing massage to HIV+ individuals applied a variety of modalities including Swedish, Deep Tissue, Reflexology, Shiatzu, Reiki, Cranial Sacral, Myofascial, and Polarity based upon several factors including client age, level of health, and current medications. The program provided twenty, one hour long massages per week, with the goal of reaching a total population of 250 individuals throughout the duration of the project. 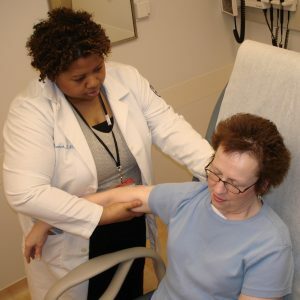 This program offered free educational workshops that use demonstrations to teach self-care massage techniques to patients with cancer, their families and friends, and cancer center staff members. Workshops for cancer patients and their families were offered twice monthly and workshops for cancer center staff members were offered once a month. These self-care workshops aimed to teach the proper use of techniques to alleviate and manage stress so the patients can more easily maintain a level of relaxation between massage therapy sessions, increase quality of life, and provide a sense of empowerment in their experience of dealing with stress and anxiety. The intention of this program was to design, implement, and evaluate a program to provide 65 perinatal and 15 infant massages to high risk pregnant women and new mothers of Manatee County, Florida. Their goal was to reduce stress, provide emotional support and physical nurturance, enhance body awareness, and the ability to relax deeply to help during labor and delivery. The majority of expectant mothers served were uninsured Hispanic/Latina and African American women who were unable to afford the cost of massage therapy. Infant massage sessions provided new mothers with safe and gentle techniques to share with their infant. Infant massage has shown to strengthen the mother-infant bond and increase confidence in parenting abilities. Weaver’s Tale Retreat Center (WTRC) has traditionally offered daylong nature programs specifically designed to increase an elder’s wellbeing. 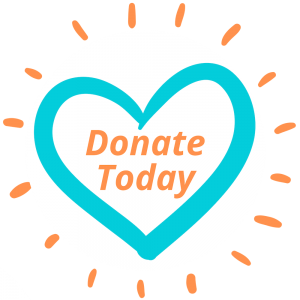 The Massage Therapy Foundation has been instrumental since the inception of this program by previously granting funds for two consecutive years. WTRC continues to offer the Caregivers Respite Retreats. Using the natural resources that Oregon has to offer, participants share in physically and mentally stimulating activities that improve their physical, mental, psychosocial, and spiritual wellbeing. 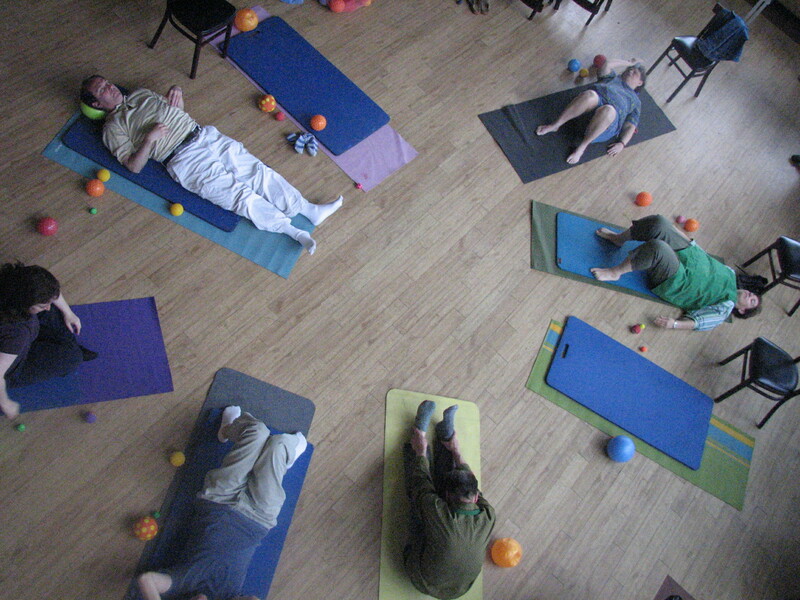 Program activities include seated massage, Pilates or yoga instruction, guided meditation, and journaling. WTRC anticipated an increased awareness of the benefits of massage for the caregiver population and among the client service coordinators of participating senior centers. They sought an increased number of participants and massage therapists at the programs as well as an increased number of massages for caregivers in the community at large. Results of the study demonstrated that caregivers have an integrated sense of control and responsibility regarding their health care and that massage promotes mental and physical health among caregivers. The objective of this program was to improve the overall well-being of caregivers of patients undergoing cancer treatment. The staff at the San Diego Cancer Research Institute (SDCRI) recognized that care-giving may cause a burden on family and friends. The goal in providing massage therapy to caregivers was to help alleviate some of their distress and promote a sense of well being by creating an environment where healing can occur. 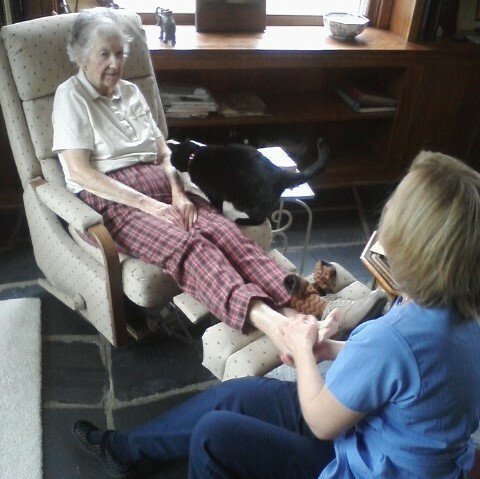 In “Caring for the Caregiver”, caregivers received chair massage while accompanying the patient for treatment. The overall aim of the project was to decrease the subjective burden, depression, and anxiety experienced by caregivers of patients with cancer by providing massage therapy services in a healing and supportive environment. The program was also intended to help the caregivers identify how their body responds to additional stress and tension, discover where they store tension in their body, and teach them ways to incorporate massage therapy into their lives in order to help reduce the side effects of stress and tension. The “Hands On” project was a woman-centered service provision plan focusing on integrating mind and body wellness with addictions treatment programming. Women that struggle with recovery are typically marginalized by society, viewed as “less than” due to their losses, and have multifaceted “bottoms” resulting in emotional, cognitive, spiritual, and physical consequences that must be worked through in order to find and support the concept of sobriety. The “Hands On” project provided therapeutic massage on-site at the women’s recovery home associated with Porter-Starke Counseling Centers. The overall objective of the project was to provide massage to female clients during their involvement in the addiction treatment program in order to assist with maintaining recovery and a chemical-free lifestyle. Vermont CARES Wellness Program provides HIV+ people with access to complementary and alternative therapies at a reduced rate. A survey conducted with HIV+ clients of Vermont CARES showed that 44% wanted to access massage therapy sessions but did not follow through due to the cost of massage services. While Vermont CARES currently offers a wide variety of complementary and alternative therapies to HIV+ people, all Massage Therapy Foundation grant money was used specifically to provide massage therapy to people living with HIV/AIDS. These funds also enabled Vermont CARES Program Specialists to distribute vouchers to clients, which were good for one hour-long massage therapy session with the therapist of their choice. For many HIV+ clients it was their first massage experience. With regular use of massage, they began to notice benefits including alleviation of chronic and temporary pain, anxiety, stress, and depression. In addition, a goal was for clients to see a boost in their immune systems, decrease in fatigue, and increased energy levels. These benefits contributed to better adherence to complex HIV treatment and a general improvement in quality of life. Counseling Services Inc. (CSI) provides mental health services to members of its community. CSI has received numerous grants form other organizations in order to support its use of massage therapy to improve mental health. 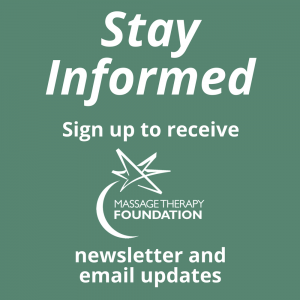 Massage Therapy Foundation resources allowed for the expansion of these important efforts. A team of mental health clinicians and massage therapists determined who would make the best candidates to receive massage therapy to improve mental health. Massage therapists provided 10 sessions of massage therapy to six clients of CSI, who are grappling with such stresses as depression, anxiety, and trauma. 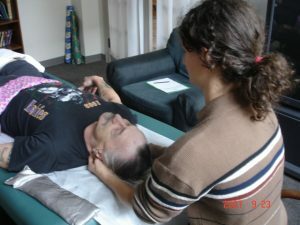 In addition to providing massage, therapists instructed the clients about self-massage techniques. The final component of the project was specialized training for CSI’s mental health staff about the benefits of massage therapy for mental health clients. Goals for the project were to promote emotional healing and mind/body integration for the client, and to strengthen the collaboration between clients, mental health clinicians, and massage therapists. The Handicapped Children’s Association (HCA) provides supportive services for children with disabilities as well as their families. Prior to funding from the Massage Therapy Foundation, the HCA did not provide massage therapy to their clients. This grant allowed twelve children with various disabilities’ such as cerebral palsy, Down syndrome, and spina bifidaÑto receive the benefits of massage therapy. During two fifteen-week periods, Ms. Winner-Dodzweit worked with children ages 3-5, providing one massage per week to each child. Family members and HCA staff attended at least one session per month, in order to acquire a basic understanding of massage therapy techniques. After the sessions were over, caregivers were able to provide massage services to the children themselves. The HCA hoped that evidence of the benefits of massage would encourage families to seek a continuation of professional massage services for their children. 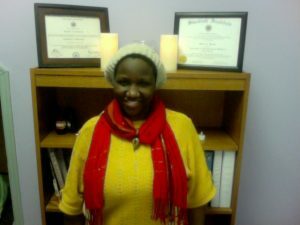 The Body-Mind-Health project instituted a program to introduce massage therapy and self massage instruction that targeted persons with mental illness who participated in the “Chatterbox” and “Connect” clubs of the Community Resources and Support program of the Anixter Center, Chicago. Goals of the project included: (a) teaching self-massage to decrease stress and anxiety, (b) teaching body-mind connection, and (c) providing massage services for clients who would otherwise be unable to afford them. Twenty five percent of clients (15 out of 62) participated in this project. The clients received 10-minute chair massages three times per month throughout the duration of the project. Results of the program were measured using satisfaction surveys; clients were happy to alleviate muscular tension and stress, and they expressed sincere gratitude for their massage. Children Unlimited, Inc. serves special needs adoptive families in South Carolina. Many of these families have adopted children who entered the child welfare system as a result of abuse and neglect. 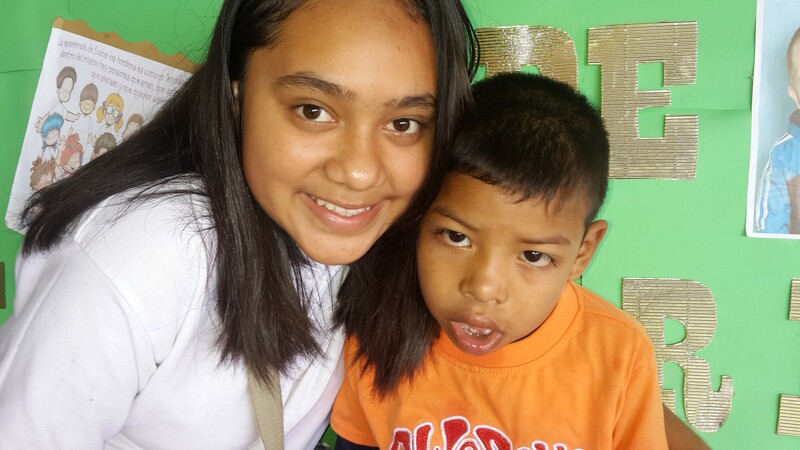 Many of the children have mental disabilities, medical conditions, and physical handicaps. Because of the abuse and neglect suffered when they were young, these children generally have problems forming attachments and meaningful relationships with others. For the massage therapists, touch is one of the primary natural tools of attachment. This project offered massage therapy to further the process of attachment for the children and their new families. A massage therapist taught the children and their adoptive parents’ awareness of their own body’s signs of tension or turmoil and, as a result, both the children and parents learned safe and acceptable touch techniques. Strengthen our Sisters (SOS) provides safe shelter for women and children fleeing domestic violence and develops model programs to assist victims in building essential life skills that will help them to break the cycles of poverty, abuse, and dependence that have dominated their lives. The SOS Wellness Project was designed to provide “good touch” by offering massage therapy for women at the shelter. The massage therapist coordinator of the project also participated in case management meetings with referring counselors and conducted monthly workshops at the battered women’s support group to educate women on the benefits of massage therapy. The overall goal of this project was to help clients learn about the connection between body, mind, and spirit and to move toward positive and productive choices in life. Information gathered during the project was used to demonstrate the effectiveness of massage therapy for victims of domestic violence and abuse to clients of SOS. V.I.CARE provides care and support for people living with HIV/AIDS in the Virgin Islands, which, at the time of this project had the fifth highest rate of new AIDS cases in the nation. While some low income people have access to basic services through public health clinics, most have no access to alternative healing services including massage therapy. “V.I. Healing Hands” provided massage therapy for low-income men and women living with HIV/AIDS. Each participant received at least four massages during a one-year period. In addition, instructional workshops in basic massage techniques were held for partners and caregivers of people living with HIV/AIDS, enabling them to provide massages to the participants in their care. This project also promoted awareness of the benefits of massage therapy among local health professionals through the publication and distribution of two newsletters documenting the project. Victim Services Center (VSC) serves victims of crime residing in Miami-Dade County. With the Massage Therapy Foundation Community Service grant, the Victim Healing Program assisted clients with their healing processes through massage therapy administered by licensed massage therapists. Massage therapy is just one component of the VSC’s services. The overall goal of the VSC is to achieve a 95% success rate in eliminating manifestations of posttraumatic stress disorder (PTSD) in clients who were victims of crimes including, but not limited to, domestic violence, childhood sexual assault, aggravated assault, murder, and shooting survivors. The grant money allowed VSC to treat clients who suffered extreme victimization with massage therapy. Massage helped lessen the stress that leads to PTSD by loosening muscle tension and aiding in the healing process by breaking down physical and emotional defense mechanisms, leading to freedom from repressed emotion and memories. In total, 42 clients received massages, 20 of which received two or more. Feedback from the clients included feeling a deeper sense of relaxation, that a chronic ache had gone away, and an improvement in their overall well-being.